Dream up a wish list of everything you'd want from a Greek holiday: talcum-soft beaches, spectacular subtropical forests, tasty cuisine and a beautiful, historic Old Town to explore. Add wall-to-wall sunshine, and you'll find Corfu ticks pretty much every box. This small Ionian island (only 40 miles long and 20 wide) is a highlight of many Mediterranean cruise itineraries, and it's not hard to see why. Corfu (known to the local Corfiots as Kerkyra) is one of Greece's most verdant and picturesque islands. Its lush interior, well-watered by winter rains and smothered in fragrant pine forests and dense olive groves, is studded with charmingly old-fashioned rural villages, where the sleepy routine is occasionally enlivened by summer religious festivals (panegyria). At such times, tempting food and craft stalls appear, a fairground atmosphere prevails and brass bands, known locally (and rather confusingly) as philharmonic orchestras, toot out foot-tapping tunes. The main festivals take place in July and August and, of course, over Easter. 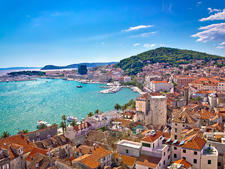 And if religion's not your thing, perhaps the two Corfu beer festivals, in July and October, will grab your attention. Most time-strapped cruise visitors confine their visits to exploring Corfu Town on the island's east coast, and this delightful medieval enclave, now a UNESCO World Heritage Site, certainly deserves the attention. You'll find historic fortresses and the vast Spianada Square (esplanade), which is the largest public square in the Balkans, as well as intriguing alleyways and spectacular statues and fountains (not to mention excellent shops and lively restaurants). If your cruise schedule allows, or you've visited Corfu Town before, you'll find it very rewarding to venture farther afield. 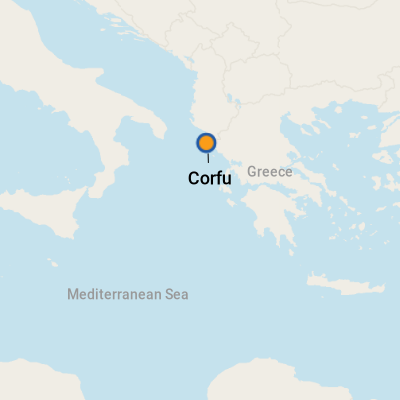 In its long history, Corfu has "belonged" to many invaders -- Byzantines, Venetians, France, Russia and Britain -- before returning to Greek rule in 1864, and all have left their cultural stamp. You'll see it in the esplanade's cricket pitch and the island's Byzantine churches, Italianate mansions and the elegant French Liston arcade. It all blends into the fascinating jumble, which makes Corfu one of the best-known and best-loved islands of the Ionian archipelago. Your ship will dock at the Neo Limani (New Port), which also accommodates ferries operating between Corfu and Italy, Greece and Albania. The cruise terminal has a duty-free shop, car rental outlets and a welcome desk at which you can pick up a map and get local orientation tips. New Port is a working dock area. Don't expect crossings to be respected, and look out for cars zooming suddenly out of side roads. If you dare to drive, beware reckless passing and center-of-the-road hogs. If you're visiting a church or monastery, respect dress codes. Women should take along a scarf to cover their arms or head and avoid short skirts; men should ditch wearing shorts unless planning a day at the beach. Siesta time runs between 3 p.m. and 5 p.m. (known locally as mikro ypno). 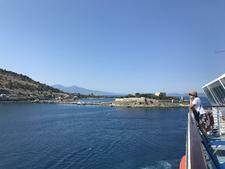 By Shuttle: Most ships offer free (or reasonably priced) shuttle transfers to the Old Fortress area of Corfu Town, which is about two miles away. By Taxi: A taxi stand sits outside the terminal building, but most drivers want to sell island tours. Negotiate the rate in advance. Establish that the fare is per cab, not per person, and pal up with other passengers for the best deals, particularly if you're planning a day at the beach. Only use cabs with meters and a rate card clearly displayed, and check that the meter is on before you start. The fare shouldn't come to more than 10 euros per cab because Corfu Town is a short distance away. By Bus: At the terminal, head left outside; the blue bus will say port. The fare to Corfu Town is about 1.50 euros one way. The green buses at New Port take you to sites around the island. Once you're in Corfu Town, the blue-coach suburban routes operate from San Rocco Square. Keep in mind that bus timings are erratic, and service can stop early in the evening. If in doubt, shuttle or cab it. By Car: If your ship's in for a long time and you're feeling adventurous, you could rent a car. You'll find desks at the airport, and one long-established company,Sunrise, is located at Ethnikis Andístasis 6, by New Port. Online bookings must be made at least 36 hours ahead of your visit to Corfu, and you must be older than 21 with a valid driver's licence of at least one year's standing. The euro is national currency in Greece. 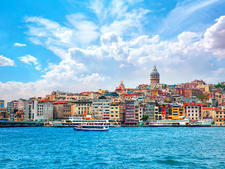 For the latest exchange rates, visit www.oanda.com or www.xe.com. ATMs are easy to find (there are dozens in Corfu Town). You'll find them mainly in banks, but they also are located on streets and in some hotels and restaurants. Some of the outlying villages also have banks with machines, but if you're heading further afield, stock up on cash before you go. Many bars and restaurants still don't accept card payments. A legacy of British rule means many Corfiots speak at least a smattering of English, particularly in the shops and restaurants of the tourist-rich old town. You'll find an English section in most restaurant menus but may have difficulty finding a specific address, as street signs are rare, and those that exist are in Greek. If in doubt, ask a shopkeeper. A friendly demeanor goes a long way, but it's also worth taking a phrasebook or language app along help. Emergency numbers worth knowing: 100 for police, 199 for fire and 166 for ambulance. If you go to a Corfu restaurant expecting to find only typical Greek staples like moussaka and dolmades on the menu, you'll be in for a pleasant surprise. Corfiot specialities are very different from those of mainland Greece. Consider the island's history, and you realize why. Like its architecture, Corfu's cuisine reflects the many invaders who, down the centuries, strove to make the island their own. So, local specialties like pastitsado (a beef and tomato stew served with pasta), Bourou-Bourou (vegetable and pasta soup) and savoro (fish fried with rosemary) reflect the island's Venetian heritage, while the local fondness for charcuterie and vinous dishes like sofrito (beef in white wine) comes from the French. What of the British? Well, they bequeathed the Corfiots a love of puddings -- though they made a style entirely their own. Over coffee, tuck into mandolato (a delicious black and white nougat), tiganites (sweet doughnuts) or sykomaitha (spiced fig cakes). Or enjoy ice cream, flavored by local fruits (including the ubiquitous kumquat). Wash it down with wine from one of the island's small vineyards like Kakotrygis, a light dry white, or Petrokoritho, a gutsy red. And if you'd like to see where chefs get their ingredients, check out Corfu Town's fish and vegetable market outside New Fort (open 7 a.m. to 2 p.m. daily). Some stallholders cook fresh-caught fish, so you can do as the locals do and enjoy a tasty lunch on the hoof. If you prefer to just wander about to see what you fancy, Kapodistriou Street and the Liston area itself are good hunting grounds for the hungry, as they are crammed with restaurants and tavernas. Just check the menus, have a peek inside and make your choice. Corfu's Old Town is by far the best place for souvenir hunters, with pretty wrought-iron garden lanterns and finely worked embroidered cloths making good buys. With so many olive trees about, olive-wood ornaments and bottles of the excellent olive oil are also worth snapping up. Foodie friends might enjoy a bottle of kumquat liqueur or a jar of kumquat marmalade (made from the fruit trees introduced to Corfu by the Chinese at the end of the 17th century).